Figure: Given single-view scans by the Kinect system, containing highly noisy and incomplete 3D scans (upper left) and corresponding RGB images (lower left), our approach is able to faithfully recover their underlying structures (yellow) by assembling suitable parts (red) in the repository models (blue). This paper presents a technique that allows quick conversion of acquired low-quality data from consumer-level scanning devices to high-quality 3D models with labeled semantic parts and meanwhile their assembly reasonably close to the underlying geometry. This is achieved by a novel structure recovery approach that is essentially local to global and bottom up, enabling the creation of new structures by assembling existing labeled parts with respect to the acquired data. 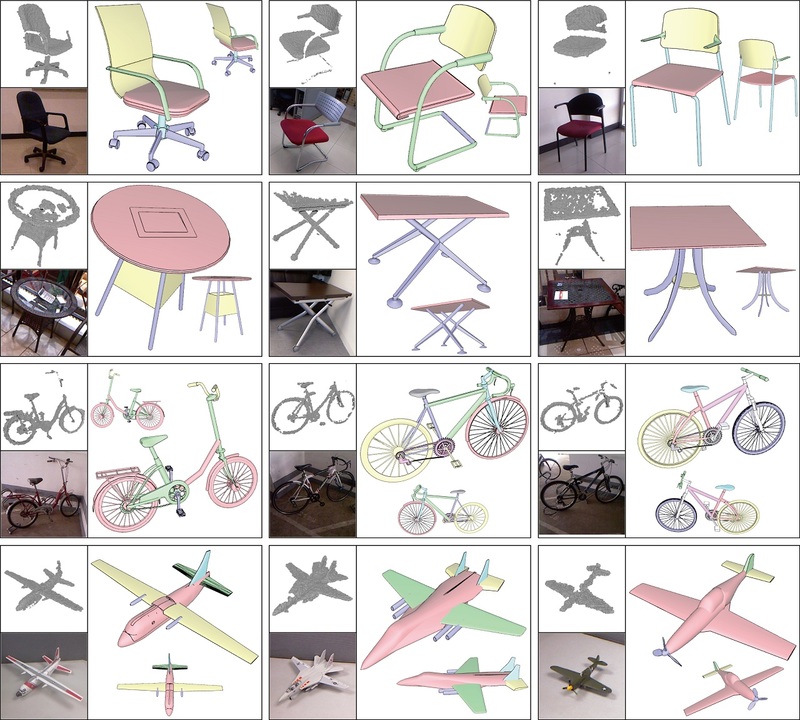 We demonstrate that using only a small-scale shape repository, our part assembly approach is able to faithfully recover a variety of high-level structures from only a single-view scan of man-made objects acquired by the Kinect system, containing a highly noisy, incomplete 3D point cloud and a corresponding RGB image. Chao-Hui Shen, Hongbo Fu, Kang Chen, and Shi-Min Hu. ACM Transactions on Graphics (Proceedings of SIGGRAPH Asia 2012), 31(6), Article 180. The input objects were all captured using the standard Kinect system of Microsoft. Parts borrowed from different repository models are shown in different colors. Last updated on December, 2012. Page maintained by Chao-Hui Shen.